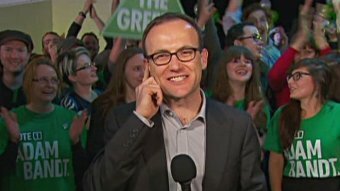 The highlight of the election for The Greens was the return of Adam Bandt to the House of Representatives. It was a vote against the tide, as nation-wide, The Green vote went down, as voters rejected their participation in minority government with Labor. With the party set to lose the balance of power in the Senate from July, The Greens must make a sharp turn towards building opposition to Abbott outside parliament in order to retain their relevance. The Greens lost 3.4 per cent in the lower house and 4.4 per cent in the Senate. Hall Greenland, The Greens candidate in Grayndler reported many people saying they were voting Labor to make sure that Abbott was not elected. Nonetheless, the party managed to re-elect all its Senators, Sarah-Hanson Young, Scott Ludlum and Peter Whish-Wilson, as well as add a new Senator from Victoria, Janet Rice. Greens leader Christine Milne explained the result by repeating the line of the defeated Labor party: “All the infighting that has gone on in the Labor Party has led people to a degree of disillusionment… some of that has rubbed off on us”. Some of the disillusionment did rub off; tellingly, some Green votes went to Clive Palmer. But it was not just about the Labor leadership. More significantly, it was taking responsibility for Labor’s unpopular policies that was to blame. Disastrously, Milne put the “achievements” of minority government—most notably the deeply unpopular carbon tax—at the centre of the Greens’ election campaign. Rather than invest public money to create jobs and deliver renewable energy, Labor and the Greens legislated a thoroughly neo-liberal scheme that left change in the hands of the market, and allowed costs to be passed onto consumers and funneled millions in subsidies to big polluters. The Greens were severely punished in Milne’s home state of Tasmania, where they are also in government with Labor and have presided over cuts to public services. There was a 9 per cent swing against Labor—the largest in the country. The Greens vote was cut in half in four out of five seats. Milne also blamed a “conservative tide coming across the country”. But despite the Coalition victory, there is no evidence of a “conservative tide” (see p8). Adam Bandt gained an extra 7.7 per cent of the primary vote and won despite Labor and Liberal directing preferences against him. Bandt’s win shows it is possible to win support for welcoming refugees and The Greens’ left-wing policies. Central to his success were links with trade unions, breaking off a chunk of Labor’s institutional support. Not only did the NTEU campaign for Bandt (and for The Greens to a lesser extent nationally) he also had support from blue-collar unions including the ETU, firefighters and CFMEU. The lesson from Bandt’s campaign is that The Greens need to consistently orient to Labor’s working class base, and recognise that the environment is also a class issue. In most Greens’ material there was nothing about Abbott’s threat to jobs and union rights. The strategy for progressive social change put forward by the Greens is almost entirely focused on parliament. They have aimed to use the “balance of power” in the Senate, and in the lower house during the minority government, to extract concessions. This approach is a tremendous pull towards electoralism; leading to compromises on principle (like the carbon tax), while delivering very little. But there is now a clear Coalition majority in the lower house and a collection of small right-wing parties in the Senate will soon hold the balance of power. This poses the question sharply for the Greens about how their representatives in parliament can actually challenge Abbott as promised by both Bandt and Milne. The Greens as a party need to be at the front of the pickets and the protests against Abbott. The Greens’ best contribution through the election period was their uncompromising stand for refugees. Across Australia, Greens MPs spoke at refugee protests against Labor’s PNG announcement. A Refugee Action Coalition rally in Marrickville was a high-point of Hall Greenland’s campaign. Adam Bandt’s campaign claimed more than 400 volunteers, who “knocked on 43,000 doors and made 23,000 phone calls”. The army of members and volunteers in all the electorates, and even more those who voted Green, need to be won to building the kind of grassroots resistance that can stop Abbott in his tracks.